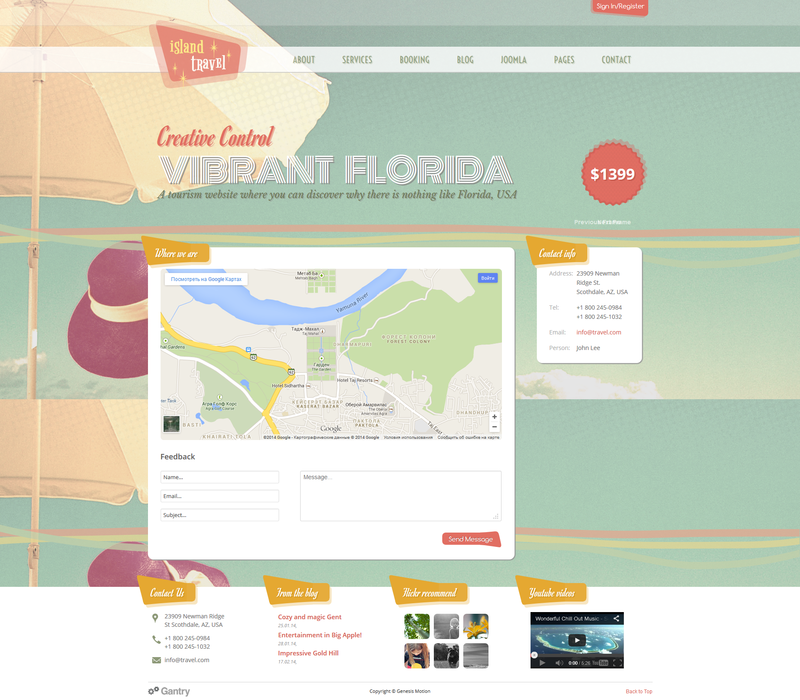 Travel Island clean and responsive Theme based on Joomla! 3.2.3. It is greate solution for your business, portfolio, travel agency and blog. 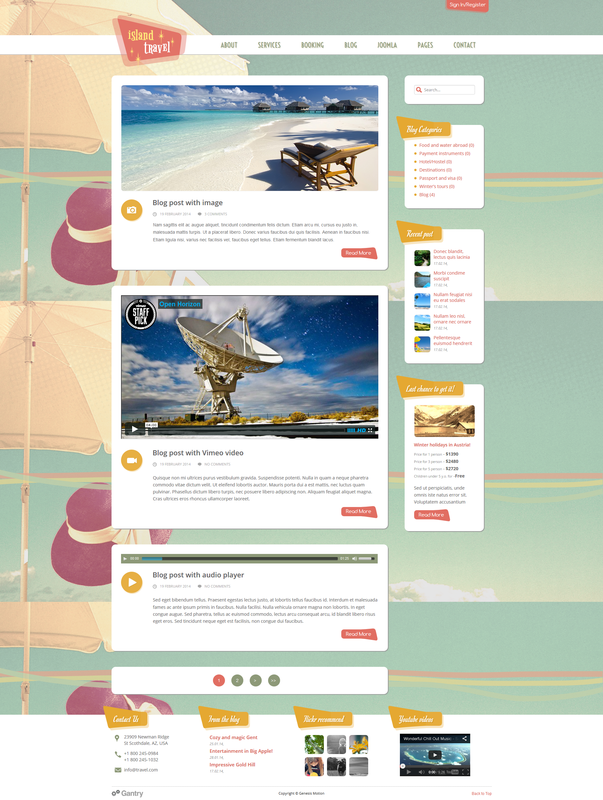 It includes Gantry Framework, ZOO component, 960 grid system based on bootstrap, responsive slider. It has plenty of positions for output and convenient control panel for managing positions, clean design (PSD included) and code. 2 minute setup. Really easy quickstart installation via FTP which set all original demo pages, posts, plugins, Theme options and all other settings. There is nothing more simle then that. All you need is just to follow documentation step by step. After instaletion QuickStart use original demo pages which are included to the Theme to make your website customization much faster and easier. Well documented and fully free supported. We've put together extensive documentation and instructions to show you how to get the Theme work with the minimum of effort. All information about installation, Slider, blog, style settings is incluted to documentation file. Even new one in web can set the Theme by himself. Support team will really fast help you with any issue you can find during customization. Just ask! The Gantry Framework is a powerful templating framework for Joomla that makes building websites easier. The feature set includes Responsive grid system, 65 base module positions, 38 possible layout combinations for mainbody and sidebars, 4 Column Mainbody, Growl-style event notifications, Flexible parameter system with ability to set parameters via URL, Cookie, Session, Presets, etc, Flexible grid layout system for unparalleled control over block sizes and much more. Solidres is a hotel booking extension for Joomla CMS.